Fareshare FoodCloud with be starting in Turriff on 17 October. FareShare FoodCloud is a new and free surplus food scheme which helps not-for-profit organisations, charities and community groups to access the free, unsold, surplus food from a day’s sales at their local Tesco supermarket. 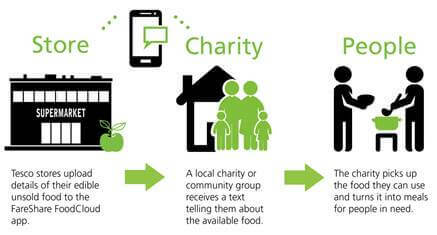 Using the simple mobile technology, FoodCloud have already helped over 1000 UK charity groups to access over 20 tonnes of fresh, good quality, free food. 1. You nominate one or more evenings per week you are available to collect surplus food from your local Tesco. 2. On those evenings at 7:30pm, you will be notified via text that your donation is available for collection. 4. This will always be a free of charge service to our charity partners. Mixed bakery, fresh fruit and vegetables are all available through FoodCloud. Chilled products are available to organisations with kitchen facilities and registered with their Local Authority Environmental Health Office. If you are a local not-for-profit organisation, charity or community group then you can register for the FareShare FoodCloud by visiting http://www.fareshare.org.uk/getting-food/ please make sure you tell them you heard about it on My Turriff.